Today is the memoria of Ignatius of Loyola the innovative founder of the Society of Jesus. It is worth considering just how new the Jesuits were, and what a radical break they introduced with all previous religious orders and spiritualities. There were always hermits living apart, then gradually hermits living together often around one particularly renowned spiritual master. The Church, a community, gradually learnt to favour monks, those who live and prayed in community over those often wild and extreme individuals who lived the wild and often self indulgent though penitential solitary life as hermits. Monastic life was essentially liturgical, the prayer of monks was the recitation of the psalter, the essential training of a young monk was to teach him to memorise the psalter, and when and how to say it, indeed that is the major concern of the Rule of St Benedict, the Father of Western Monasticism. Alongside monks were Canons, living an often slightly mitigated monastic life to serve a particularly significant Church. Again their life, though often less concerned with silence and penance, was essentially focussed on the liturgy of the hours. Friars followed, their life was essentially one of teaching and preaching but still with the liturgy, the singing of the Divine Office as the backbone of their life. There were always of course secular clergy whose prime function was to offer at least daily Lauds and Vespers for their congregations, and Mass as well on Sundays and feastdays but primarily they sang the Liturgy of the Hours for or on behalf of their people. The most radical change that Jesuits introduced was that they were not committed to the common or public recitation of the Divine Office, even in Jesuit houses the Office was said privately, though devotions of one kind or another might be done publicly, the Church's liturgy became an entirely private affair, except possibly with the exception of Sunday Vespers but even this became a source of "devotions" a basis for Rosary, sermon, litanies and Benediction. Before the Jesuits churches consisted of nave, chancel and sanctuary but because there was not public chanting of the Office, there was no need of a chancel with its choir stalls in their churches and they quickly disappeared from new parish churches and chapels too after the Counter-Reformation. Under Ignatius' inspiration 'liturgy' for the faithful became just the Mass. The Office was said by clergy under obligation, for early Jesuits it was a burden whereas other forms of prayer were a joy. Another Jesuit innovation was mental prayer - unknown in ancient monastic Rules - but even among the friars, especially the Carmelites it tended towards the via negativa, whilst the Jesuits, following the example of Ignatius' Spiritual Exercises gave full scope to the imagination, 'picturing a scene' moved very quickly from the minds of Jesuits to the walls, ceilings and altar pieces of their churches. Most importantly the Jesuit disdain for liturgy and preference for devotion brought about a serious change in western theology. 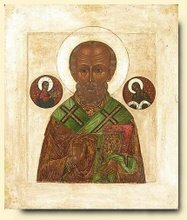 In the West and in the East from the very beginning the source, the root, the matrix of theology was the sacred liturgy. The Jesuits became the first to abandon Liturgy as the basis of their theology, which accounts for the wilder excesses of counter-reformation theology and devotionalism, as well as the eccentric theology, based on secular learning, philosophies and sociology that prepared for and followed the Vatican Council. St Ignatius and his Company of Jesus did extraordinary things for evangelisation following their foundation but their disdain for Liturgy has introduced a fault line into Western Christianity that has deeply wounded our intellectual life and it looks as if it is to continue. Pope Benedict saw the liturgy and a return to the liturgical mystogogical theology of the Fathers as healing, both for the West in particular, but also for the division between East and West, as did VII in Sacrosanctum Concillium and its general call to return to Patristic study. I am not sure whether Papa Bergoglio and most contemporary Jesuits and those who have taken up Jesuit inspired theology understand this, they think as Jesuits, not as people imbued and formed by the riches of the Liturgy. A great many Trads seem to be concerned that Francis is showing himself as antagonistic towards Benedict, I do not know if that is so but what I am convinced of is that Benedict was antagonistic towards Francis and the whole Jesuit non-liturgical school of theology, as is anyone who cares for the Liturgy. I have no special insight into the current situation of the Franciscan Friars of the Immaculate apart from odd snippets of gossip and what I have read on the net. One thing about them is that they are Franciscan, and what we know of Franciscans from history is that they tend to split, even in Francis' own lifetime there were divisions. Francis was an inspirational charismatic leader but not that good an administrator, therefore we shouldn't be too surprised that his faithful sons and daughters exhibit the same tendency as his first followers. There are several stories that are quite shocking about Francis' demand for obedience from his followers, for example telling a brother to bury himself to bury himself in a dunghill until he had "died to self". The FFI are a new order and they are flourishing, their founder Fr Stefano Maria Manelli however, who is certainly inspirational, has been accused of 'certain irregularities', hence his removal and replacement by a Capuchin appointed by the Holy See. The problem with zealous young orders is that often they lack the restraint of older moderating influences, they grow too quickly, they are charismatic. One of the problems with Manelli seems to have been his reliance on Franciscan obedience, which basically boils down to his will imposing the EF on the FFI rather than a consensus being achieved, though it could be argued that there is a consensus among the younger friars but not the older ones. The Pope's words on Pelagianism in the new religious orders certainly applies to the Legionaries of Christ and might possibly apply to the FFIs, it is the problem the early Franciscans had when they took Francis' will as trumping everything, a problem too for Blessed Theresa of Calcutta's sisters. With the FFI it seems that some of the original friars wanted to hold onto the original charism of dedication to Mary Immaculate, Manelli seems to have tweeked this slightly by adding 'a preference for the traditional rite'. Whilst the young friars happily seemed to have embraced this decision of the founder, some of the older founding friars have objected that that was not what they had signed up to. Hence the Holy Sees demand that they return to the Ordinary Form of the Roman Rite from mid-August, presumably until a consensus can be arrived at. What is beautifully Franciscan about is the docility of the Friars themselves to the Holy See. The Bishop of Rome returns from Brazil in triumph, even the western media seemed impressed. In everything he did he excelled. There was no complex theology, indeed his short addresses were not great teaching moments and in many ways predictable, which seems to be Francis' charm. His nonchalant attitude to security, his obvious delight at being with the crowds, his casual homely way, his pleasure at being disruptive himself, the almost anarchic revelling in being 'not the Pope', I mean his obvious joy on his visit to the slums, in saying he would like to visit everyone's house, to ask for a glass of water, or perhaps have a cup of coffee, actually seemed to make him appear as visiting great uncle, a friend, rather than a visiting bishop. Someone willing to listen as much as someone come to teach. For me his lack of theology actually seemed a strong point. For the media, he seemed to say what they expected a Pope to say, a message of reconciliation. Francis preaching by smiles and hugs, even a few tears, a cup of mate, a sombrero, an indigenous headdress, casual conversations with embraces and kisses, in fact his physical openness to the world was actually much more coherent than any words he had to say. His message was simple, "to the streets, bring Christ the edges of society". Francis himself through his actions is a model of this. Personally, I have had difficulty with the transition from Benedict to Francis, maybe because I was trying to "read Francis through Benedict" rather than seeing both as gift from God to his Church. Francis intention seems to be simply to show human warmth as a means first to being human, then to evangelisation, Benedict actually did the same, he visited drug addicts embraced the poor, sat down and eat with the homeless, which Francis has yet to do but it was his words, his teaching we wanted. Francis really has nothing very exciting to say, it is a bit ambiguous, imprecise, often he appears to contradict on Monday what he said the previous Wednesday. His words are stream of consciousness stuff, it is his actions that are important. I think we should stop reading or hearing Francis through his predecessor but rather see his actions through the theology of his predecessors. If we can see anything of God's Providence through Francis, perhaps God is saying enough of theology, enough words, enough discussion, now go and embrace, smile hug, show kindness, go the slums, reach out to the young, embrace the unbeliever, draw in the outsider. On the plane back he seemed to show the same sense of reconciliation, he wants to emphasise the positive, whether it is about homosexuals who genuinely seeking Christ, or any other section of the Church. We really do not need to see that Church as a fortress keeping out the enemy but rather a ship come to rescue fallen frightened humanity. The Church does not exist for its members but for humanity, we are indeed sent to evangelise. I am beginning to see Francis as an antidote to illness of the Church since the Council, where for the past 50 years we have been looking inwards to such an extent that the world sees Christ's disciples not as a source of goodness and hope for the world but as something evil, corrupt and immoral. I thought I had seen the ridiculous side of the Church but here is the pits. There is nothing worst than mutton pretending to be lamb. If this is what these men think is going to inspire "the youth", heaven help us. The words of consecration "This is my body", "This is my blood" suggest an intimacy between the consecrator and that which consecrated, an intimacy necessary in other sacrament where touching and laying on of hands is necessary. When that intimacy breaks down the distance between the priest and the bread and wine is no longer within touching distance, then more correctly "this" actually should be replaced with "that", which are not Jesus' words. But what when, for example at WYD with a million attendees, there are concelebrating priest who are unable to see the bread and wine and the priest has to take it on trust that there is bread and wine on the altar, is he really saying Mass, if not what is he doing? I was very pleased that the Bishop of Rome visited a hospital for drug addicts, pleased too that he said the Church was with drug addicts and pleased that he felt able to say that though difficult it is possible to break addiction. Here, not a few of my parishioners are recovering addicts of one sort or another, faith, repentance, a sense that "there is a Power greater" than them and their dependency helps. Never the less death by overdose, death by suicide are pretty common in Brighton amongst the young, as is the involvement of addicts in crime to feed their addiction. Prostitution, theft, broken relationships, damaged children are very much part of the lives of addicts. The whole course of drugs from there production in places like Afghanistan in the third world, through to their transportation and distribution by smugglers and dealers is about exploitation of the poor. Tin pot regimes, failing economies, organisations from the IRA to the Taliban, and various Mafias all exploit drug users, all prey on their weakness. Invariable the dealers themselves are addicts, dependant on exploiting others and encouraging theirs friends to become addicts in order to pay for their fix. In Portugal there is a social experiment to treat drug addiction as a 'health issue' and to decriminalise users, to treat them as victims of organised crime in need of the mercy of the State, various South American governments have been looking to follow a similar programme, Yesterday the Holy Father, like Pope Benedict when he visited another Brazilian facility for recovering drug addicts, said he was not in favour of such a course of action, he knows the South American situation better than me, but I am uncomfortable with his apparent blanket condemnation of decriminalisation. My experience is that a habit which can easily cost a thousand pounds a week or more in Brighton, places the addict in a situation in which he or she is enthral to organised crime either pushing drugs themselves or in theft and prostitution or smuggling drugs from country to country. It is the huge expense that causes the problems. The Portuguese experiment makes drugs available on prescription which means that addiction is separated directly from the murky underworld of crime and also means that addicts can be treated. The major success of the Portuguese experiment seems to be that addicts are not turned into pushers and dealers and the pyramid selling scheme which makes international drug crime so profitable is undercut at its root. It takes the prophet out of it. I would have been happier if Francis had taken an overview of the international drug scene starting from the exploitation of impoverished poppy growers by local warlords. He might well be right that in South America taking a more liberal attitude to drug addiction might not work but in the rest of the world simply doing what we are doing does nothing for those whose lives are destroyed by those who make vast amounts of money from the broken damaged, frequently early ended lives of addicts. I am actually sick of the suicides, overdoses and misery in the lives of the addicts I come across. Pray for the addicts in Brighton. Music can drive you far from God! Ti-tee-tum-tee tum ti... or tum ti-ti ti-ti tum..., it gives me a head ache, I hate the music at World Youth Day liturgies, it is entertainment, show tunes, it drives prayer out of my head or reduces it "Lord, stop, please", It is what I imagine Americans troops play to torture inmates at their unsavoury prison at Guantanamo. If I was present in Rio I would tear my vestments off and run naked screaming from the basilica, clawing at my bloody ears and have to be restrained and shut in a dark room by burly nuns, most probably for months, if not years, possibly even until death, which could or could not be in a state of Grace. I will read what the Bishop of Rome has to say, it is probably going to be quite exciting. The dreadful thing is some you will agree with me. We could fill a whole locked ward to ourselves and even have matching straight-jackets. Others might wisely counsel me to pull myself together, and stop behaving like a silly adolescent and accept the stuff as penance for the common good, and others less wisely simply assure me next time round there might be something that pleases me. Yet others might suggest that they know of a little church hidden away somewhere where not just the music but the action and indeed the whole liturgy might be more to my taste, which is equally worrying. 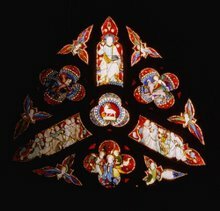 The great problem is that music in church has become something that actually is a matter of taste and if one doesn't share that taste it actually can drive people out and the great problem is that they can be driven so far away that the actually die far from the sacraments and the mercy of Our Mother the Church. Church music has always been controlled and frequently reformed because some music be so destructive. To be evangelised is one thing, that is an act of Grace but to like or even be tolerant of a particular musical genre is another thing. God can draw someone into a deep and profound desire for Him but the man with the tambourine or even sackbut or organ can drive out any desire for Communion with God in a particular community, such people can be hated even by the most pious, often by the most pious. One can switch off an irritating, even heretical, priest's homily, one of parishioners often turns on her ipod when I preach. You close your eyes to shenanigans on the sanctuary but music touches the soul, even if you try to ignore it you can't. The medieval Church and universities took up Pythagoras and the Greeks who understood music to speak directly to the soul and could either inflame passions or to bring healing and concord to the soul. Music should be healing and therapeutic but being adolescent again, in Church, it is so often torture! That is obviously not so here where we tend to do our best to use that great corpus of Catholic music that has been tried and tested down the ages to soothe the savage breast and draw us closer to God, that music which is designed to speak at the same time to those who want to dance and those who wanted to mourn, it is designed to support the relationship with God, not to take over from it but the problem is that most people think we use the Church's music because it is music I like. It has become a matter of taste, which is presumably why VII's intention to have some music at all liturgical celebrations has been ignored and most people prefer the 'music lovers Mass', the Missa Lecta, read Mass, with no music. John Allen, following the Popes in flight press conference, suggest that World Youth Day could become World Youth and Elderly Day. It would indeed be a rather Francis type of thing, getting people to move out of their 'self-reverential' comfort zones. First, young pilgrims could be encouraged to reach out to elderly persons in the locales in which the event takes place -- visiting homes for senior citizens, for instance, or visiting families in which elderly members play a prominent role. Second, participants might be encouraged to work on oral history projects either on the ground during the event or back home once they've returned, collecting the testimonies of elderly Catholics about how the church and the world have changed during their lifetimes, what's stayed with them despite those changes, and so on. In that way, the testimony of the older generation would be preserved and transmitted. My great anxiety is having all those aging hippies involved in the Catechesis: Hans Kung, the Tablet team, ACTA, it is all a bit frightening. I remember a friend jokingly suggesting to a elderly German priest that he was surprised he wasn't going to an early JPII Youth Day, his reply, "I had enough of that kind of thing in Nuremberg in the the 1930s!" The problem with all of these events is how to keep the fresh and not to be self-celebratory or self-reverential or any other manifestation of 'self'', for the Pope, the organizers, the youth or even the city of Rio, in short how to make it 'poor'. I was quite taken by the story of the Pope being stuck in a traffic jam, one of the reason for the demonstrations in Rio is the difficulty and cost of public transport, it was rather nicely done by the Pope to treat it as something to be amused by and enjoyed. These photographs were taken yesterday from my upstairs landing of the pub opposite. Clearly visible is a member of a certain Roman dicastery. I don't know why they should be around here on Maudlin Day, I said nothing very controversial..
'Her jewel', its a cope morse but we haven't had a priest here with the right to wear it since the turn of the previous century, Provost Moore, in the 1900s. The Mass, A bit too much exuberance from the thurifer for the Roman Rite. 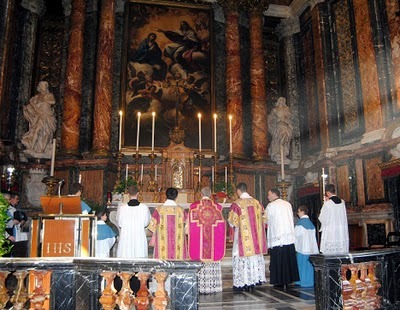 Of the many options in the modern Roman Rite we choose the option to celebrate both Forms facing the same direction that the congregation face, it just seems natural and amongst our many visitors rarely raises a comment. It seems to be only clergy who have a difficulty with it. It is of course an entirely legitimate option for any priest to use according to the CDW. That alb was a bit of a mistake aesthetically, not much of it but it was a really hot day and what linen there is in it was cool, I always wear what the sacristans decide. The chasuble of white silk and silver and gold thread is from Signor Mancinelli, the maniple is a bit ridiculous and of course not strictly necessary in the Ordinary Form. Veneration of the relic after Mass, or some of my charismatic parishioners call it 'a healing service'. During the coming week we will celebrate a votive Mass of the Magdalen whenever possible. As Pope Francis begins a week celebrating World Youth Day in Brazil, the first scandal of the new Pontificate is beginning to break in Rome. The respected Vaticanologist Sandro Magister makes the claim that Monsignor Battista Ricca who seems to have impressed the Pope before the Conclave and then was appointed, on the Pope's initiative as "prelate” of the Institute for Works of Religion by him has had a rather unsavoury past. The immediate Vatican response, which presumably comes directly from the Pope through Fr Lombardi, is simply to say Magister is lying, or rather that his sources are 'unreliable'. Magister gives dates and places and names, the Vatican response is not to refute any of this but simply to adopt the tone of Cardinal Sodano on child abuse that Magister's accusation are 'merely press gossip'. There is no attempt to refute anything Magister puts forward, no talk of an investigation, let alone a suspension pending an investigation, the normal procedure for an ordinary priest if serious accusations are made. Pope Francis himself raised the issue of a 'Gay lobby' in his off the cuff remarks to the Latin American religious, inadvertently inviting journalist to look for irregularities, now the Pope seems to be suggesting things are hushed up. Magister has placed his reputation on the line and, if the Pope via Fr Lombardi is right, leaves himself open to prosecution for libel, whilst the Vatican again gives the impression of cover-up and accusations of being nothing more than a murky renaissance nepotistic principality rather than an open transparent institution on its way to the promised Franciscan reform. The suggestion is that the conservative Sodano/Re faction are still in control, so expect only cosmetic changes! Sad. Ah good, it has been made public at last, rumours have been buzzing around for sometime, now it has been made public, the Oxford Oratorians are taking over St Wilfrid's in York which is directly opposite York Minster. Another rumour is that the large numbers who attended the LMS Pilgrimage was a strong influence in Bishop Drainey's decision. In 2011 700 pilgrims had to celebrate Mass in the Minster, when St Wilfrid's was unavailable, the following year, and I thin this the Bishop himself took part and attended in choro. Interesting Ampleforth is withdrawing from so many parishes and the rather trad Oratorians are expanding, I pray they will be as successful in York as they were when they took over from the Jesuits in Oxford. A friend was in Rome for the novices and seminarians 'rally' with Pope Francis. He was very impressed especially with the numbers of young men and women in habits and cassocks on the Roman streets. He saw the rapturous welcome given to the Pope at the audience on the Saturday and at the more muted on at the Mass on the Sunday. He spent quite some time talking to English speaking student's for the priesthood, both members of religious orders and diocesan seminarians from the US, E&W, Australia and elsewhere, as well as Italian students. He was impressed by the enthusiasm for, 'going out to the peripheries', though most admitted not to quite understanding what Pope Francis meant by it. What he said seemed significant was the enthusiasm they all seemed to have for Pope Benedict, under whom they had discovered their vocation. He said what surprised him was a deep sense of bereavement practically all seemed to express. Another priest told me a seminarian had said to him of Benedict's resignation, 'I feel bereaved, I feel my father has left me'. There are many younger priests and lay people, who seem to share the bereavement of that seminarian, I do myself. After the death of a Pope there is a period of mourning, even cries of 'sancto subito', Benedict's departure was merely marked by the whirl of a helicopter and the closing of the gates of Castel Gandolfo. The three months of Francis' pontificate for many seems to be a going back 40 years to the time of Paul VI when everything was in flux and little was certain. It is not just the signs and symbols of Papacy, or even Liturgy shoes and vestments but theology of continuation that they signified, which is much more important. Francis' casting aside of these things and his preference for a style of forty years ago seems say something of his theological mind set. Our faith teaches us that the Church is 'Inerrant', that the hell will not prevail against the Church, that the Holy Spirit leads the Church into all Truth, that Christ will be with us to the end of time, etc., etc. but then against that so much seems to be up for grabs. Everyone seems to accept the need for reform or renewal of the Pit which is the Curia, there is talk about decentralisation, talk even of Synodal government of the Church. There are suggestions that though the Catholic Faith, for example, on the nature of marriage is unchanging but that the discipline concerning how those who are in irregular unions could be dealt with on a more localised level. The same with how pro-gay, pro-abort politicians are to be dealt with, and other issues besides, which in fact might be just a recognition of what in fact actually is the real situation. Cardinal Burke might say one thing but local bishops, even Italian bishops, even bishops in the diocese of Rome say something quite different. At the end of JPII's regin there were two major theological trends, simply put, Ratzinger's based on centralisation and Walter Kasper's, (a development of Paul VI's rather stop start theology) based on localisation. Kasper, interestingly, was the first theologians quoted by Francis as Pope. The problem is that most of the Cardinal's including the 'Gang of Eight' are conservatives, whose conservatism goes back to their seminary days in the reign of Pope Paul VI. Is this healthy for the Church? I don't know, it strikes me there is something disorienting and destructive of unity, in pendulums swinging in opposite directions with each Pope. Has Pope Francis the intellectual capacity, the courage and the charisma to do what is necessary but most of all the ability to hold the Church together while he does it? Let us pray he has. Returning one again to Professor Tracey Rowland's talk, I do not want to speak about the adolescent outbursts in some quarters that followed her edited interview on Youtube issued by CNS. It was published following her highly praised speech on the Usus Antiquior and the New Evangelisation delivered at the Liturgia Sacra Conference in Rome last month, there is a summary here. I had hoped that her paper might have been published somewhere by now. However, six years on it is worth asking whether Summorum Pontificum has added much to the Church and whether it really has much relevance for the Church today and Evangelisation. Benedict's choice of the date 07/07/07, tripling the mystical number, to publish it seems like a rather gentle Benedictine'joke' to underline its importance. For Benedict, so concerned in his Papacy with reconciliation, saw SP as a way of reconciling the Church's past with its present. At a time when rupture was seen as the dominant interpretation of Vatican his words, "What earlier generations held as sacred, remains sacred and great for us too, and it cannot be all of a sudden entirely forbidden or even considered harmful", came like gentle balm. That sentence and the de-ghettoisation of the ancient Rite gave a tangible foundation to Benedict's theology of 'the hermeneutic of continuity', no longer can 'Liberal' pastors and theologians speak in terms that suggest the Church had a Pol Pot style 'year zero' sometime in the 1970s. To think that less than a decade before 07/07/07 Cardinal Noe used to mince around his basilica, he was Archpriest, and would remove the cruets from the credence ledge of any priest celebrating the traditional rite, compare that with Fr Smith's report of St Peter's here of liturgical life early in the morning at St Peter's. There is something about the 'old Mass' and the 4th Commandment, 'honour you mother and father and you will live long in the land', in broad terms, a connection with the past and belonging results in stability and prosperity. Vatican II's document on Christian Unity said that disunity was a scandal which impeded evangelisation. The scandal of the Church hate its immediate past is hardly healthy, and pre 07/07/07 that seemed to be how the Church presented itself. The former Abbot of Worth, Fr Christopher Jamison, now the Director for the National Office of Vocation spoke a few months ago about the high proportion of young men who applied to Westminster diocese whose vocational formation was much influenced often heavily by the old Mass. Here, in my parish we had to stop offering E.F. High Mass or even sung Mass because both servers who were capable of being MC both left, one to be a brother of Birmingham Oratory and the other joined an order in France that exclusively celebrates the EF. I estimate a good 30% plus of young priest I know of either celebrate the Traditional Mass as one of their 'first Masses' or learn it within a couple of years of Ordination. Along with the Mass goes a serious interest in the theology and especially the theology and spirituality of the priesthood that flows from it, often, still, to the chagrin of the seminary authorities and their diocesan bishop. I really do not think Benedict expected every priest in the world to suddenly start celebrating the Traditional Mass, he made a point of not doing so publicly himself but he spoke 'mutual enrichment' and with it gone are the Bugnini days of stressing the rubrics of the old Rite do not (necessarily) apply to the new, indeed Benedict seemed to use the old prayers for incensation, gestures and even liturgical ornaments of the older Rite, on a few occasions he gave the impression of using the older offertory prayers, but most especially he used the older form as the source of his theology. So often the images in his sermons and quotations are from the older Rite. Rhanner and many of the Concilliar and later Jesuit theologians might well have scorned the liturgy as the source of theology but for Benedict the liturgy, as given, is the 'source and summit' of his theology and those he has, and will, influence. It has always be the source and expression of the Church's theology, for Paul VI and JPII whilst the liturgy was in flux this may have been lacking, this was not so with Benedict whose insistence that liturgy is 'fixed' and his own example has returned us to what is theology's bedrock. For Benedict SP is about preparing the Church to be effective in evangelisation. On the ground he has scattered seeds, they need time to germinate. Some might moan that despite SP they can't get to a Traditional Mass, even in a large city. In many places Mass is still advertised as "Low Mass at 3.45pm on the fifth Sunday of alternative winter months, telephone before coming". No-one expected that all of a sudden bishops would be sending priests brought up to mistrust 'tradition' off on training courses, there are rare exceptions like Bishop Dominique Rey of Toulon Frejus who seems to ordain more priests than the rest France put together, other than the diocese of Paris and a few there are a US bishops who actively encourage the older use, where this has happened vocations seem to be increasingly plentiful, where it has not they are few. Today, because of SP the liturgy of the Catholic Church is plural, the older Rite belongs to everyone, it is not the preserve of an aesthetic or sartorial elite, which was Professor Rowland's point, even if they try to claim it as their own ghetto, and her most important was that it does not belong to groups like the SSPX or other groups, whose raison d'etre seems increasingly to be to oppose a legitimate Council of Holy Church. Though one might have a preference for either form, to be solely attached to one or the other, whilst despising the other is totally contrary to the intention of SP and contrary to Catholic sensibility. Professor Rowland in her talk seems to be trying understand why Pope Benedict took the rather risky step (remember the reaction of the French bishops and others who seemed threaten schism over SP) of liberalising the ancient Mass. Here in the UK several priests have used the TLM as part of a strategy to evangelise. Richard Collins recently made the wise observation that the TLM was a little like cigarettes or whiskey, a pleasure which at first might be not so pleasant but soon can become addictive, I suspect he had the Missa Lecta more in mind than High or Sung Mass. Here, in my parish, we have used High Mass for various important occasions, my silver jubilee, the 150 Anniversary of the opening of our church and great feasts, with encouraging results, all of these occasions have brought the lapsed or even non-believers in and caused them to wonder. In many ways solemn celebrations of the Traditional Mass are actually more accessible than the Ordinary Form. The entrance point for the Traditional Mass is simply an openness to beauty, or the transcendent, or even western culture, for the Ordinary Form as usually celebrated it demands at least a comprehension of a vernacular language, some grounding in scripture and the current ecclesiastical culture - by that I mean at its lowest level simply knowing the hymns, a being comfortable with, or lacking a prejudice against a particular musical style. 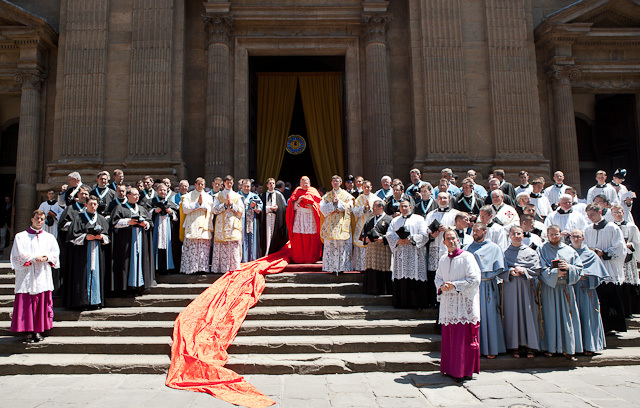 The Novus Ordo as it is currently celebrated either draws people in or repels them, Benedict's insistence on 'correct' translations of the Latin texts, the assertion of the 'giveness' of the Liturgy, was a reminder that the Novus Ordo had like the TLM an objective reality and was not supposed to be subjective as both its more liberal supporters and conservative detractors often claim. Improvisations, along with balloons, ceramic vessels and clowns are an aberration, so too the imposition of an individual celebrants personality, style or preferences. Even so I would suggest that the TLM, in its solemn forms offers to the unchurched a 'worship experience' which can be more profound and more easily comprehended, it invites the participants into the mysteries of Redemption, by down playing the initial response of intellectual comprehension it allows a much more visceral response. A Jewish friend and former parishioner tells of his conversion beginning with High Mass, Thomas Merton speaks of his conversion too beginning by a chance encounter with the mutter of the Mass, an important part of my own conversion was stumbling into a Paris Church and hearing the singing of Introit whilst the clergy ascended the altar steps to sing Mass amidst a cloud of incense. 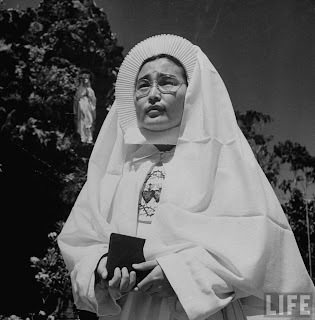 A Filipino former member of our congregation, arriving in London to work for someone near Harrod's, with no English and as she admitted herself with no education found herself torn between a Filipino charismatic prayer group and the TLM (and the Lady Altar) at the London Oratory. The TLM, which for her like the boys at St Peter's was the 'New Mass' with no cultural baggage at all won out. Brighton is sizzling nicely, so now is the time for the annual notice in the newsletter about modesty in dress. For the young and beautiful too much exposed flesh leads to l-ust, for the old and wrinkly (like me) it leads to disg-ust. Fr Abberton posted this video of Dr Tracey Rowland who gave what many people said was an outstanding talk Liturgia Sacra Conference in Rome on “The Usus Antiquior and the New Evangelisation”. One of things she said was that 'Ordinary Catholics do not want to feel as though in attending the usus antiquior they are making a political stand against the Second Vatican Council', she had also complained about the 'politico-theological baggage' that is associated with the Ancient Mass. This video seem to be a before or after the talk interview, not meant to stand alone, it is obviously a 'selected clip. However it is good to see a few illustrations of what she was talking about as 'politico-theological baggage': a) aestheticism, making the Mass into a rubrical or artistic rather than spiritual experience, criticising details b) oddly dressed attendees, I have been to places where those at the traditional Mass do tend to look like the supporting cast of Downton Abbey or Brideshead, c) allowing the Mass to be used as means to criticise or even oppose Vatican II, even when understood in an orthodox way. I think that Dr Rowland might have added a socio-political stance too. In some parts of the States I am told that it appeared everyone at a Traditional Mass was a pro-gun, anti-immigration, home-schooling, anti-Obama, pro-Sarah Palin, tea-partying, potential member of the Klu Klux Klan. In the UK it could be argued the Traditional Mass belongs to a certain class but obviously not in Brighton. Brighton Latin Mass attendees discussing Fortescue on the solita oscula in a low Mass after 1962 and the aesthetics of Fr Ray's Latin pronunciation, 2 out of 3 prefer it the 'low voice'. Obsculta, o fili, præcepta magistri, et inclina aurem cordis tui. 'Listen, O Son to the teaching of the Master and bend the ear of your heart'. Thus begins the Holy Rule of our father St Benedict whose feast day it is today. "Listening" and "bending the ear of the heart" is at the centre of Benedict's Rule, 'what has been lost by disobedience let us regain by obedience", the word "obedience" here can be understood in terms of to 'listen intently to' 'oboedire' . The whole of the rule is to create an environment where someone can listen to God and gradually learn to stop listening to himself. We can understand Jesus' summary of the Law and the Prophets in Matthew 22:37, 'Thou shalt love the Lord thy God with all thy heart, and with all thy soul, and with all thy mind.' as being about handing over one's very soul in obedience to God, it is about interior submission of heart and soul and mind to God. Everything about a monks life, his stability, conversion of life and his obedience, the monks three vows, is about this submission of his heart to God. Today in this country most of our monastic communities are hanging on a knife edge, there are exceptions but several are unlikely to be in place in twenty years time. Like canaries in a mine monastic life reflects the health of the life the Church in general. The busy-ness of modern life both secular and religious does not bode well for monastic life. Most of all our liturgical life does not lead to a life of contemplation, it is worth reflecting that the more of Traditional worship a monastery takes on the more it seems to flourish. 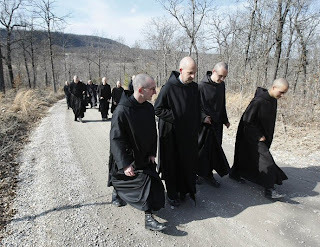 New monastic communities at least in the Europe and America are invariably 'old rite', think of Fontgombault and its daughter Clear Creek or the young Canons of Lagrasse or the Franciscan's of the Immaculate. It could simply be that the 'old rite' demands more time spent in Church or that those attracted to such communities are prepared for the contemplative life by attendance at the Traditional Rites. I remember a trad guest at an English monastery saying the monks now spent more time preparing for one of the 'hours' than they did in actually singing it. It is not necessarily just the time spent in prayer that is problematic but the actual nature of prayer that has changed, the unreformed monastic Offiice ended with a few brief Kyries, the Pater and the Collect, now to its culmination is added a series of Intercessions. Possibly I am over stressing this but the unreformed Office, and therefore monastic prayer was entirely about praise, adding specific intercessions, for the sick, artists and craftsmen, the bishop, vocations etc. changes it. Rather than its end being contemplation it becomes about intercession, a subtle movement from 'being' to 'doing', it brings about a change in the anthropology of a monks. Monastic life used to be centred on the hortus conclusus of the cloister and the liturgy, now the cloister no longer seems to satisfy. At one time a monk, even more so a nun, would enter the cloister knowing they would never leave it, not even to attend a parent's funeral, things seem to have changed. I am not criticising merely suggesting things have changed, I think it is rather good to have email contact with monastic friends but there was a time when even postage stamps were limited in a monastery, none at all in Lent, one or two a month at other times. The change is interesting. 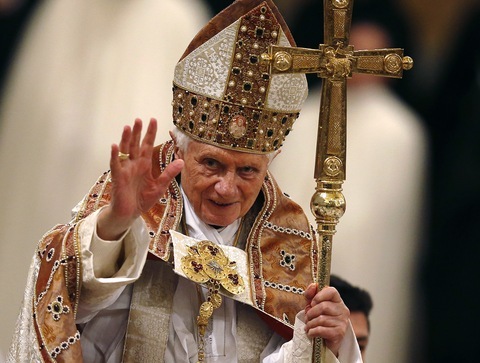 One of the reason the Pope Emeritus chose the name Benedict would seem to be to recapture the contemplative nature Catholicism and the priesthood, and most importantly the contemplative nature of Christian prayer, it was his life's work. ....as a precious gift for the Church and for the world, a gift that contains a deep message for our life and for the whole of humanity. I shall sum it up like this: by withdrawing into silence and solitude, human beings, so to speak, "expose" themselves to reality in their nakedness, to that apparent "void," which I mentioned at the outset, in order to experience instead Fullness, the presence of God, of the most royal Reality that exists and that lies beyond the tangible dimension. He is a perceptible presence in every created thing: in the air that we breathe, in the light that we see and that warms us, in the grass, in stones.... God, Creator omnium, [the Creator of all], passes through all things but is beyond them and for this very reason is the foundation of them all. The monk, in leaving all, "takes a risk," as it were: he exposes himself to solitude and silence in order to live on nothing but the essential, and precisely in living the essential he also finds a deep communion with his brethren, with every human being.